Has God’s Dietary Law Been Done Away With? A couple of years ago I wrote an article titled Swine’s Blood On The Altar in which I contrasted the differences in diet and the digestion process between cows and pigs. I will not rehash that in this article. Instead, I will deal only with those verses Constantinian Christians use to try and prove that Yeshua overturned his Father’s Dietary Law. Then three times (verse 16), Peter is instructed not to call what God has cleansed common. Now verse 17 is the proof that Peter understood his vision to be symbolic—not taken literally, not about eating—for in verse 17, Peter “wonders” what his vision meant. He would not have been wondering this had he understood his vision to mean that now pigs, lobsters, toads, salamanders and such were to be eaten as food, as most preachers since Constantine insist. In verse 28, Peter gives the correct interpretation. “You know how unlawful it is for a man, a Jew, to unite with or to come near to one of another race. Yet God showed me not to call any man common or unclean.” LITV—Literal Version. Those of you who have read and studied the beginning of the book, the TORAH, know that Peter’s reference to it being un-lawful to associate with those outside of Judaism comes from Rabbinic Oral Law. Such a law can be found nowhere in TORAH. This was Oral tradition, the sort of man-made Rabbinic laws that Yeshua railed against. Peter was not claiming God told him to nullify Leviticus 11. Did Yeshua declare all meats now clean? Many translators—disregarding God’s command never to add to or take away from His word—have inserted their heretical assumption that he did. Yet the discourse in those verses is not about what is and is not food. It’s about ritual handwashing before eating, a Rabbinic tradition (7:5), which Yeshua’s disciples did not adhere to. It’s about forsaking the commandments of God (commandments like those in Leviticus 11, in which God establishes what is and is not food) for the doctrines, the commandments, of men. Yeshua railed against their setting aside the commandments of God, in order to keep these traditions. In 7: 15, the Messiah stated that it is what comes out of a man (from his heart) that defiles him (not eating with unwashed hands). In verse 19, quoting from the Literal Translation, it says: “because it does not enter into his heart, but into the belly, and goes out into the waste-bowl, purging all the foods. Now the Greek word kath-ar-id’-zo can mean either cleans or purge. But based on the context of “going out of the body into the toilet,” the correct choice could ONLY be PURGE! It can never mean to PURIFY! What goes into the toilet is not purified; it is purged! Now the original KJV version translated kath-ar-id’-zo correctly as purge. The New KJV, however, among several other modern translations render kath-ar-id’-zo as cleansing, after which they insert their heretical summation that Yeshua just declared all foods clean. No! Our sinless Messiah, who Scripture says came only to do his Father’s will, and who said that if we love him, we would keep his commandments, commandments from which, in Matthew 5 he said, not one jot would pass away, our Messiah who warned of a day coming when he’d command those working “anomia” lawlessness, to depart from him, did not, in one vague passage, nullify hundreds of Scriptural admonitions not to eat abominable things. Our Creator, who knows the end from the beginning, and who never changes, determined once and for all, in Leviticus 11, what is and is not food. 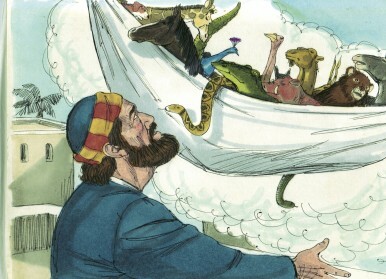 Here again, those who choose those things in which God has no pleasure (Isa 66:4), who choose to eat abdominal swine’s flesh, (Isa 66:17), like to twist Paul’s statement in I Timothy 4: 4, that every creature of God is good, and nothing to be thrust away, out of context in order to try and prove God’s dietary law has been done away with. Before I get into the context of verses 1-4, and the crucial point made in verse 5, allow me to remind the reader that Peter warned in II Peter 3: 16 that some things Paul writes are hard to understand, and that the unlearned (in the Law) and the unsettled pervert what he writes to their own destruction. Peter warns in verse 17 not be led astray by the error of the “athesmos”, the lawless. Now, let’s start at verse one, in I Timothy 4, to establish context–for any text without context is a pretext. But the Spirit expressly says that in latter times some will depart from the faith (by faith, it is clear Timothy is speaking of God’s instructions, his law) cleaving to deceiving spirits and teachings of demons, (verse 2) in lying speakers in hypocrisy, being seared in their own conscience, (verse 3) forbidding to marry (God’s word establishes marriage; Gnostics forbid marriage), saying to abstain from foods (God’s law establishes what is food for man; Gnostics taught to abstain from eating), which God created for partaking with thanksgiving by the believers (in Yah’s word) and those knowing the truth. (Psalms 119: 142 “. . . Your Law is truth.”) Now here is the key—in verse 5— for through God’s Word (Leviticus 11) and supplication (prayer) it is sanctified. By the very definition of sanctified–to be separated from the profane, the common, the unclean–if every animal on the face of the earth were good for food, no animal would be sanctified, no animals would be set apart from others. Clearly, 1Timothy 4 does not claim that creatures like pigs and salamanders, which were created by God, are now to be considered food. Paul is simply saying, in his sometimes hard to understand way, that those creatures God designed and declared to be eaten as food (Leviticus 11) are not to be refused, as the Gnostics, against whom Paul was preaching, urged their followers. Paul writes that those creatures sanctified, which by its very definition means to set apart from the profane (abominable things like pig, lobster, and shrimp) by God’s word are not to be rejected. Paul was not teaching against God’s dietary law, but against Gnostic doctrine. And nowhere in God’s word have pigs ever been set apart as food. Was God declaring every animal meat for man? No! He was not! He was simply declaring that now, after the flood, since it would take time to grow plants, man could add to his formerly vegetarian diet, meat. And although it does not say in Genesis 9:3 that he was referring only to meat from clean animals, Genesis 7:2 makes that clear. For in Genesis 7:2, Noah was instructed to take into the ark seven pairs (male and female) of every clean animal, while only one pair of every unclean animal. Paul writes, “…let no man judge you in eating or in drinking.” Does that mean that our sometimes confusing Paul was teaching God’s dietary law has been done away with? No! In verse 2:20, Paul refers to these as rudiments of the world (KJV), and in verse 22 he describes them as the doctrines of men! Paul was not there, nor anywhere else in the ‘new’ Testament, teaching against God’s dietary laws. And receive the one who is weak in the faith, not to judgments of your thoughts. One indeed believes he can eat all things, but being weak, another eats only vegetables. When Paul says one believes he can eat all things, he does not mean meats which God has determined are not foods in Leviticus 11. He is simply contrasting those who eat all the things God has declared as food to those who only eat vegetables. What about I Corinthian 10:25? What about Acts 15: 20? Doesn’t it make the case that Gentiles don’t have to follow the LAW, except to abstain from idols, fornication, things strangled, and from blood? You see, there were some Pharisees telling the new Gentile believers that thy must first be circumcised to be saved. But the apostles knew better. They knew that God had already offered them salvation through faith (just like he had Abraham, way before Abraham was circumcised), and sealed them with the Holy Spirit. The apostles knew also that these Gentiles, fresh out of Paganism, needed to abstain immediately from idols, fornication, eating strangled animals and eating blood, all which are strictly forbidden in God’s law. But not wanting to overwhelm them, the apostles instructed these new believers to focus on these four (for now), FOR (agar) every Sabbath the law of Moses, or to be more exact, the Law God gave to Moses, would be taught in every synagogue. Verse 21, shows that the apostles fully expected these new believers, who had been given the Holy Spirit, would attend, learn God’s law, and obey it–not in order to be saved, but because they had been saved. The proof for this supposition can be found in Romans 8: 4. It proclaims that the righteous requirements of the law would be fulfilled by those who walk by the Spirit, and these new, formerly Gentile, converts had been given the Spirit. And you may note that I said formerly Gentile converts, because Paul in Ephesians 2:12-13, declared that these former Gentiles, through faith in the Messiah, had become part of the Commonwealth of Israel. Did I cover all your concerns? I apologize if I have left out any dietary scriptures that you would like explained. Please, if I did, add a comment in the section below, and I will try to address it. In closing, I would like to mention something I recently learned through the ministry of Matthew Vander Els regarding circulation differing in clean and unclean animals. I was so excited, I went searching on the internet. This is what I found. Below is a quote about Rabbi Zamir Cohen’s book: The Coming Revolution. To that, all I can add is isn’t Yah awesome! In reading your well supported writing I could not help but wonder why you came to the conclusion that in Genesis 9:3 God was Not declaring “Every moving thing that lives shall be meat for you”. It would seem to me that right after the Flood there were no dietary restrictions, only identification of clean vs unclean animals. The restrictions on what foods to eat or not eat wasn’t given until after the Exodus in the Torah’s Books of Leviticus and Deuteronomy as part of the Covenant for the people God separated unto Himself. I would appreciate any comment showing where I may have missed something. How refreshing it is for someone to speak the truth and get away from the deception. There is so much deception out there. There are so many believers believing the LIE that Yeshua came to do away with everything that was spoken back in Leviticus. It is so unfortunate that the oral Torah has crept into Many areas of the body of Yeshua. And it is used to pervert the context of the very word of YHWH. That is why we must study to show ourselves approved. You know if the father is perfect and everything that he speaks is perfect then how can anything that is perfect be done away with. We must remember that Perfection cannot be changed and if it’s perfect there is no need to take it away or do away with it because there is no error in perfection. What an awesome article but not just awesome, for the truth will always Witness to the spirit. Bar’coth Ahav and shalom shalom. Thank you so much. This is one of my favorite topics. Thanks, my dear cousin! How are you? Really good article Chris! You lay out each detail in scripture so that if one was to argue they would clearly be in rebellion to the Almighty. I pray YHWH reveal!!! TY! Anita ??? Thanks, Anita! I appreciate that. Like Yeshua said “nothing” will pass from the Law (instructions) of God until Heaven and earth pass away, and they are both still here. So those teaching that any part of God’s law has been done away with will be “least in the Kingdom.” If they have a problem with that they need to take it up with Yeshua, since He said it, not me. Nice article by the way maybe sharing it on facebook and google. Thanks, Butch! I have posted this on face book before, and I will do it again right now. Wisdom 16:26 That one verse makes it very clear as to what little is needed. Sounds inspired to me. In 1 Cor 8:8 it is written we are neither the worse if we do not eat, nor the better if we do. Sounds like you’re better off if you do not eat, and worse if you do. The very letters that some churches have used to deceive the people have turned the tables , and revealed their , ignorance or greed. You can decide , witch. IT also sounds like the more you eat the more you struggle. DO not let that verse slip by you, I’ll say that again, please do not let that verse slip by you. Because that one verse alone that’s found in one of the very letters of paul is the very opposite of what a lot of churches have been telling the people. With pauls letters you could lead the people one of two ways. With the Gospels and Old Testament you can’t, unless they are blind. And that’s not all the churches have misled the people about. If I were to mention the law again I’d have to share more with you. At times when the law is mentioned in the new testament its referring to the TEN COMMANDMENTS. And another definition given refers to food, AS BEING PARCELED OUT. So if anyone says to you that it’s buy GRACE we are saved not works. You could thank them and let them know that you are very aware of that. And then you could enlighten them by asking them if they know the definition of the word iniquity? Some BIBLES say evil doers, the American standard uses the very words, lawlessness. You see, without GRACE you will never get into Heaven and without the law you will not know the way. Take a look at some churches, didn’t take long to confirm that. When a church keeps wolfing down a full plate the results will eventually be seen. AND if you want to know what she is really like, try taking some off that plate. You can discover a lot quickly if you know where to dig. And if she doesn’t care about her own flesh and blood then why would it care at all about yours? To many full plates have lead to a lot of RECKLESS AND FALSE counselors. Over a thousand different (so called) Christian denominations. One of their most popular sayings seems to be, you are saved by Grace not works. Are you saying that you’re to wicked to ever do any good ? Think about how that sounds. Some Churches are more like a family business than a church. Most looking for their own piece of the action, humble dollar. How many churches do you know of that read the HOLY BIBLE so that they would know how to cause others to stumble or give, give? THINK ABOUT THAT. Sounds to repulsive to be true, AY. Thanks for your response. In another article I wrote titled: Curse of the Law: Understanding Galatians (available at Bulldozerfaith.com) I addressed many of Paul’s statements that too many in the Church have misinterpreted for a very long time. That’s for your points. Blessings! Yah is amazing ! Thank you you for this article .